I've literally been waiting forever to have Happy Hour at Chez Kenzo. And my wish finally came true! Happy Hour group and I went down a couple Thursdays ago around 530pm. They are located in the old Verbano on King Street, in the Bank of Hawaii building. Park in their parking lot- it's free. Happy Hour is from 5-7pm and a bunch of food and drinks are discounted. Drinks range from $2-$5, and there's about 8 menu items from $1.75-$6. Such a great deal!! I also wanted to try some items from the regular menu, so we did that also. Dish after dish after dish came, and we had so much food on the table! Helps, too, when you have some great friends that own/work the restaurant- thank you Richie! I was highly impressed with the service and the food. We had a large reservation, but they situated us in a room off of the main dining area where we could laugh and make all the noise we wanted. Some of my favorite food and drink? Well, I tried all three of the Happy Hour Sake cocktails: Midori, Momo, and Sensy, and I literally loved all of 'em. So easy to drink! I also had a $2 sake shot, which I thought was a great deal. I highly recommend coming during their Happy Hour! You will save some bucks and eat well! I loved the Hane Cheese Gyoza. Not typically a huge fan of gyoza, but when wrapped in cheese, trust me, you will love it too. The pesto pasta for only $6 Happy Hour was a hit too. Such a simple dish, but it was so flavorful, and topped with pine nuts. We eventually got another order when it was the last call for Happy Hour. Everyone also loved the Kabocha with Bacon. Tender morsels of pumpkin and little bits of crispy bacon mixed together made the ultimate sweet/salty combination. A must get. Another favorite of mine was the Shabu Shabu Salad. It seemed stranged at first, and I wasn't sure if I'd like it, but it was excellent!! It is a simple salad with cucumbers and tomatoes, topped with a bunch of thin, tender Shabu Shabu beef. Then a savory Oriental dressing is poured on top. Really unique and wonderful. I think we had 3 orders of this! And lastly, I made it a top priority to try their Uni Pasta. It didn't come out on top when pitched against Taormina or Arancino's version, but they made great effort. Sticking with the asian theme, it came with Tobiko mixed in and topped with Nori. There weren't any big chunks of Uni, but the pasta was mighty orange! I suspect it was infused and mixed well into the pasta. Trust me, after all of that, we didn't stop there. Dessert time! It was my friend, Casie's Bday, so they brought out a Cheesecake and candle. So sweet! The Cheesecake was unique in the fact that it had a Créme Brulee crunchy top! Yep, they add caramel and brown sugar and blow-torch it. BEST Cheesecake I've ever had. No doubt. Not to forget Chez' Parfait! Omg, another successful dessert! And remember, I'm not even a huge dessert fan, but with desserts like these set in front of me, I am definitely going to have a bite...or two....or three. Their Parfait was again, unlike any others. 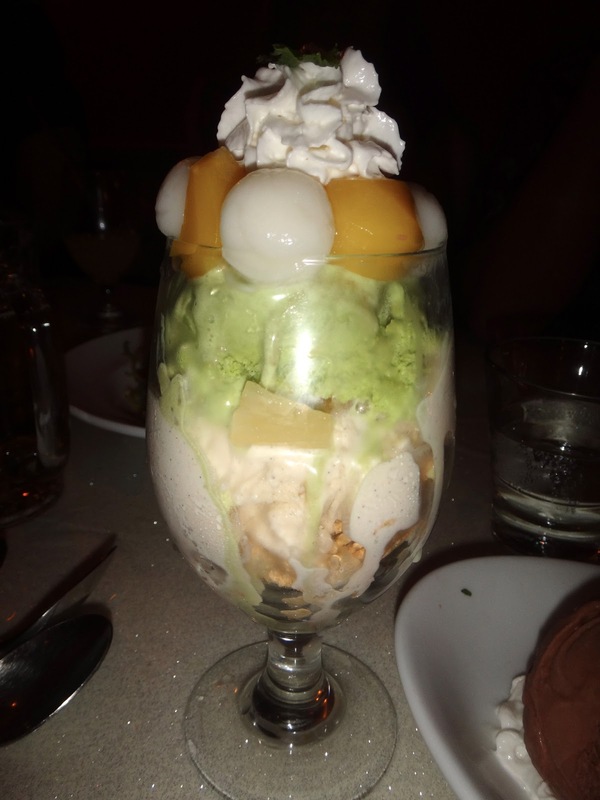 Layer upon layer of rice crispies, vanilla and green tea ice cream, azuki beans, mochi balls and much much more. Add whipped cream on top, and boy, that is one hell of a parfait. I thoroughly enjoyed Chez Kenzo (pronounced SHAY-KENZO). They had great ideas on food combinations, and the flavors meshed well. I was dazzled at how tasty their vast menu is. Usually with that many choices on the menu, some things will just be mediocre. I'd have to say most of what we ordered was amazing. I definitely recommend this place! Shabu Shabu Salad- SO tasty! !